The inauguration is set for 22 March in a “simple” joint ceremony based on unity between Greek Orthodox, Armenians and Latins (Roman Catholics), this according to Fr. Sinisa Srebenovic. The work “brought together even more” the three great communities. Work on the basilica floor is the next step. 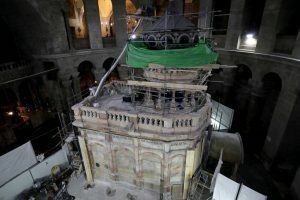 Jerusalem (AsiaNews) – The reopening of the Holy Sepulchre after the restoration work is an invitation to pilgrims from around the world, but especially in Europe and the West, to “come and visit the Holy Land.” They are, together with the local community, the “living stones” that make up “a unique land,” said Franciscan friar Br Sinisa Srebenovic. Restoration work on Jesus’s tomb began just under a year ago, in May 2016. Ten months later, scaffolding was removed from the aedicule making it visible. Some work is still ongoing in the non-visible part of the tomb, which will be completed in time for the inauguration. The goal is to consolidate the whole structure, and preserve it from damage from quakes, like that of 1927. Both public and private groups are funding the work. The Holy Sepulchre was built by the Roman Emperor Constantine in 325 AD after his mother Helena found the site. Over the centuries it has been partially destroyed and rebuilt and is one of the most visited and venerated sites in the Holy Land. The last consolidation work of the Anastasis dates back to 1947 by the British; however, it could not be completed because the Orthodox, Armenians and Franciscans failed to agree upon it. The structure covers the site where the remains of Jesus were placed after his death on the cross. For almost a year, a team of Greek researchers worked tirelessly in the holy place, without preventing the faithful from accessing it. According to Br Sinisa Srebenovic, the restoration has brought closer together the three great communities in the Holy Land – the Greek Orthodox, Latin and Armenian – in the name of a “path started with the work in Bethlehem and continued here at the Holy Sepulchre”. The inauguration will be a “shared moment” with a “shared purpose” in the name of “simplicity.” The event is scheduled for 10 am on 22 March in the presence of representatives of the Franciscan, Greek orthodox and Armenian communities. There will be “three chants for each community”, Br Srebenovic noted, followed by the address of the Custos of the Holy Land and the Armenian and Greek Orthodox patriarchs. “The Lord’s Prayer in each language” will conclude the service. 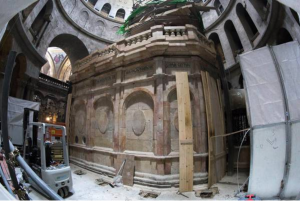 Restoration at Tomb of Holy Sepulchre coming to and end!